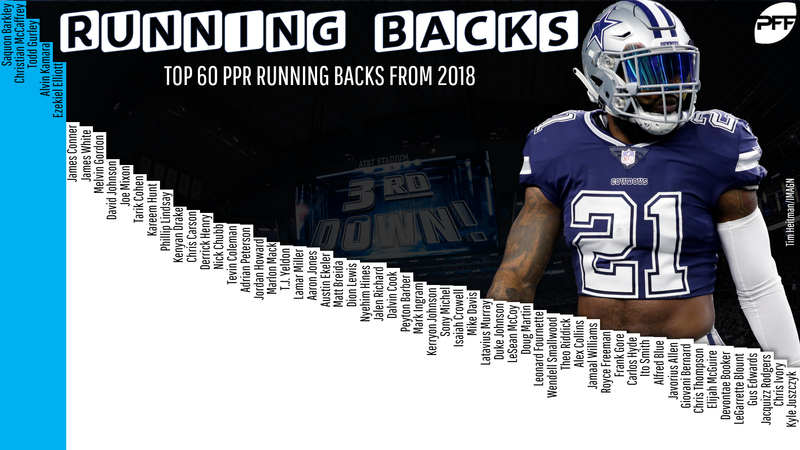 For the true fantasy football addicts among us, below you will find my “never too early” 2019 tiered rankings for the running back position with accompanying analysis. We already tackled the quarterback position here. This information is also now actionable, thanks to best-ball leagues with drafts taking place already on DRAFT.com and BestBall10s.com. Gurley led all running backs in fantasy points per game (26.6), followed by Barkley (24.11) and then McCaffrey (24.09). Gurley also led the position in fantasy points per game in 2017 (25.6) but sits at the tail end of this tier due to his usage down the stretch. In the postseason, Gurley was out-touched by C.J. Anderson 49 to 34. It’s hard to say how much of this was due to a knee injury, or if this was a sign of usage to come. I’ll need to hear McVay recommit to Gurley as a bell cow before moving him back up this list. … This comment from head coach Ron Rivera on McCaffrey explains why he’s ranked behind Elliott. From Week 10 until the end of the season, Elliott saw the best usage of his career, and the best usage of any player over that span, averaging 22.8 carries and 7.1 targets per game. I have Kamara tentatively ranked as my No. 5 overall running back but could legitimately move him all the way up to No. 1 overall if Mark Ingram doesn’t re-sign with New Orleans. Kamara averaged a whopping 33.0 fantasy points per game through the first four weeks of the season, while Ingram was serving a suspension. … Gordon has had trouble finishing out seasons, but has ranked top-six in fantasy points per game in each of the past three seasons. … It’s not a given, but I’m confident Conner will be back to reprise his role as Pittsburgh’s bell cow. If that’s the case, Conner seems likely to rank top-three in snap share and expected fantasy points per game. Somehow, Johnson’s 2018 season was only slightly less disappointing than Bell’s. Hopefully, their 2019 seasons will look more like their 2016 seasons, if Bell lands on the right team and head coach Kliff Klingsbury can get the most out of Johnson’s talents. … The only running backs to finish ahead of Mixon in fantasy points per game were Kareem Hunt and Tier 1 and 2 backs. His usage was good, but he wasn’t really a true bell cow, playing on only 66% of the team’s snaps and drawing just 53% of the team’s targets out of the backfield (in games Giovani Bernard was active). … Cook has had trouble staying healthy, but was efficient (ranking first in missed tackles forced per touch of 56 qualifying running backs) and saw good usage toward the tail end of the season (76% of the snaps from Week 11 until the end of the season). 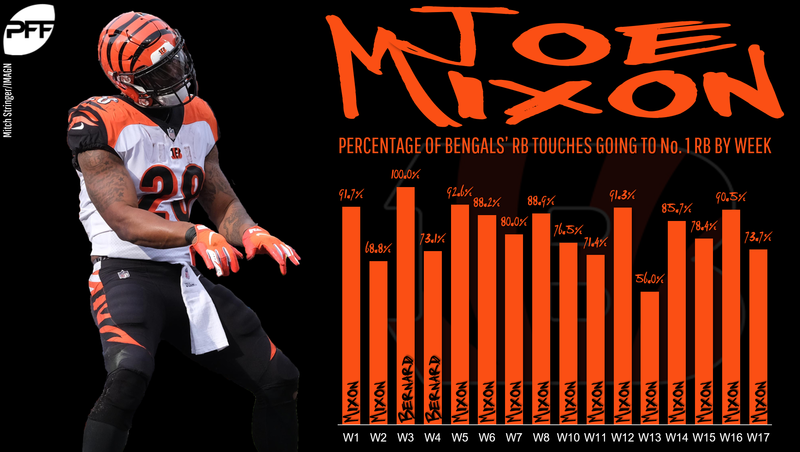 … Jones will be a massive value in 2019 drafts for all of the reasons outlined here. I think he should be drafted as a RB1, though his ADP will put him as a low-end RB2 in both redraft and dynasty leagues. Freeman played in just two games in 2018 (due to injury), but finished first, seventh, and 12th in fantasy points per game across the three seasons prior. It’s also possible (if unlikely) that he’ll see a larger workload this year, as Tevin Coleman is an unrestricted free agent. … It’s not a lock that Williams sees a bell-cow workload in 2019, but if he does, he has legitimate mid-range RB1 upside. I dug deeper on Williams and his 2019 value here. 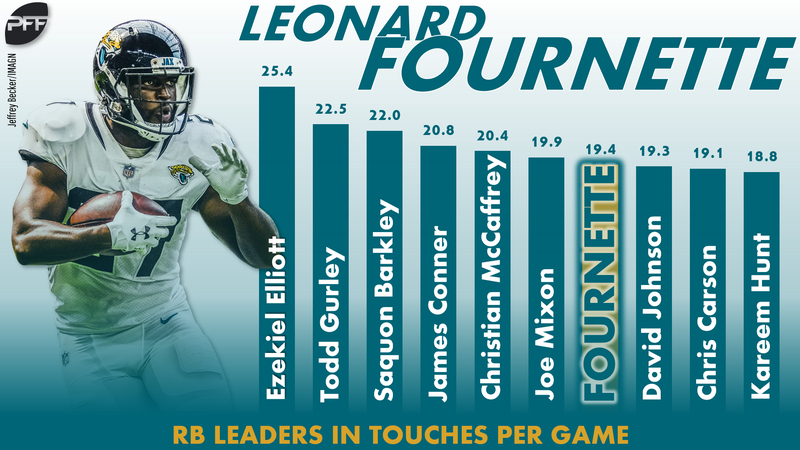 … I’ve been one of Fournette’s biggest critics since he was drafted, but volume is king, and when healthy he’s been a lock for nearly 20-30 touches per game. Tier 5 consists mostly of highly talented running backs likely stuck in a committee situation. Though in every case they’re their team’s lead back, these are still typically the sort of running backs I let my opponents draft. I explain why here. With the exception of 30-year-old McCoy and possibly McKinnon, we have another group of running backs likely to be stuck in committee situations. Ingram and Coleman also might not be, depending on where they land, but I’d wager all six of these running backs will be fairly maddening to own on a week-to-week basis. Tier 7 is just about the same as Tier 6, just with a little more risk, a little more week-to-week unpredictability, and a little less upside.